The ICA is doing pretty well right now. Tomorrow they're putting on the New Speakers' Corner event which we reported on earlier, and next week they launch a six-week series of talks entitled London in 6 easy steps. In an attempt to "examine London as it is today" the Institute have recruited six London-based curators to present their interpretation of "the current artistic and cultural life of London." Each curator gets one week to exhibit in the Lower Gallery and the idea is to recognise a new movement in the capital's art scene, a movement that exists outsode of the shadow cast by the YBA's and Saatchi. The sequence of six quickly changing exhibitions of London in Six Easy Steps will refer to the constantly changing fabric of London, a city that is characterised by a multi-layered and shifting urban landscape, and a nascent contemporary art scene that has yet to establish its terrain. Each exhibition will run from Tuesday to Sunday and each Tuesday evening the curators will give a personal introduction to their exhibition in the Upper Gallery. 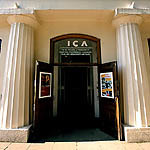 There are complete details of the curators and times etc on the ICA site.